Buddhist Mala Policies: Welcome! 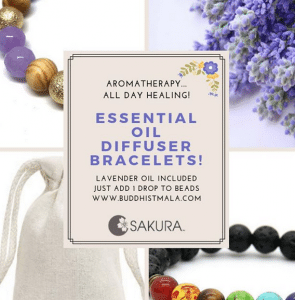 Shopping with Sakura Designs at BuddhistMala.com is simple and secure. We have a requested $20.00 product purchase minimum. We accept Visa, MasterCard, American Express, Discover and PayPal. Your order is sent over a highly secure server, and your privacy is 100% protected. We ship on weekdays, Holidays excluded. Orders will be sent via US Postal Service Airmail, so allow 3-6 business days for U.S.delivery, and up to 1-4 weeks for international. Most orders shipped next day, or within 72 hours during weekdays. We can offer express shipping, but still request a 72 hour processing time, and you may have to sign for your parcel and pick it up at the post office. For custom orders, please allow one additional business week. If you have not received your US order after 10 full business days, you may then contact us for re-tracking info. Postal Delivery times not guaranteed. Re-tracking requests prior to the allotted delivery time cannot be responded to, as our staff is very small. Canceled Orders are orders that are canceled before they are shipped. We have a 8% processing fee for canceled orders for our staff accounting time, if they are able to be canceled before processing. Cancellation is not guaranteed. Please allow up to one billing cycle for credits to post back to your statement. * Delivery method (standard versus expedited). Loss is highly unlikely, and most all lost or delayed parcels eventually are found! US Orders under $300 are not insured and we do not require a signature confirmation. Most orders are shipped in a standard 9 x 12 Priority Mail Flat Rate Envelope. If after we provide proof of shipping and postal delivery confirmation, the parcel has not arrived, and you suspect theft or mis-delivery, you must then contact your local post or eventually authorities to investigate. We waive all liability after successful delivery is confirmed by the US Post. Please contact your local carrier and file a loss report with the Delivery Confirmation number provided, and this can be done HERE. NEW! If there is a delivery problem in the US, and the parcel is still within the USPS system, you can file a redelivery HERE. We carefully hand-select and craft each of our products to ensure the most economical and highest quality materials. If you have purchased any retail item* as shown and are unsatisfied for any reason at all, feel free to return your product, unused and in re-sellable condition by contacting us within 10 calendar days of order receipt for a “no hassle” return authorization. (*Items described as “Closeout” as non-returnable and sold “AS IS”) Holiday Gift orders placed after Dec. 8th have a special return extension until Jan. 8th. If your order is unused, and sent back in perfect, re-sellable condition with original packaging including mala bag intact, you will be refunded the product purchase price, less a 15% restocking fee (7.5% for malas exceeding $250). Shipping to and fro is not-refundable. Returns after 30 days from purchase date are not accepted. Please do contact us at info@buddhistmala.com prior to returning any item, and we will give you return instructions. Please allow up to two billing cycles after we receive your item back (30 days) for credits to post.We cannot be liable for product misuse or customer damage, and can not offer a refund in these circumstances, even if it is before the 30 day warranty period. Our prices are considered “wholesale to the public,” and if you are an authorized reseller, we may be able to offer further discounts if you order in volume, (min. of 6 full malas per style) please inquire. Volume discounted special orders are non-refundable. We have an in-house designer that can create a personalized mala, just for you for and additional $28, plus materials. Click here for custom design options If need be, we also offer professional design consultation by phone or email at the rate of $50/hour. If you prefer not to specify a custom request, we will send the design as photographed. By default,many of our 108 bead malas are beautifully made “tibetan or mantra style” withadditional marker beads (interval beads) after #21 and after #54, or divided into quadrants 27 x 4=108. They are properly finished with a three holed guru bead and tassel (recommended for the longest wear), perfect for mantra practice. If you have purchased a custom design other than what is photographed,we will try our very best to accommodate requests, and ask for some designflexibility since we are trading in variable, natural materials over the internet. Sakura Designs must waive *all* return/ restringing liability if you choose a custom design rather than what is photographed, so please carefully read about our Custom Design Policies. If you receive a damaged/defective product, please retain all packaging and notify us immediately for claim instructions or a Return Authorization. You may be asked to show damaged package to shipper to apply for reimbursement if your package was insured, or send it back to us. If it is determined that product was damaged by shipper, a refund or replacement product will be sent if available as soon as we receive the damaged item back. The same policy applies if you have received an incorrect item. Please note that we often use natural hand-cut materials for our malas, the stone quality varies from AA- B grade. There are inherent slight inclusions/ imperfections with natural stone beads and should not be considered a defect. Coral is particularly porous and these “nuisances” add to the handcrafted beauty of working with natural materials. Default warranty on all products- We will ensure that all products that *we* manufacture are sent are free of manufacturing defects for 30 calendar days from date of purchase. 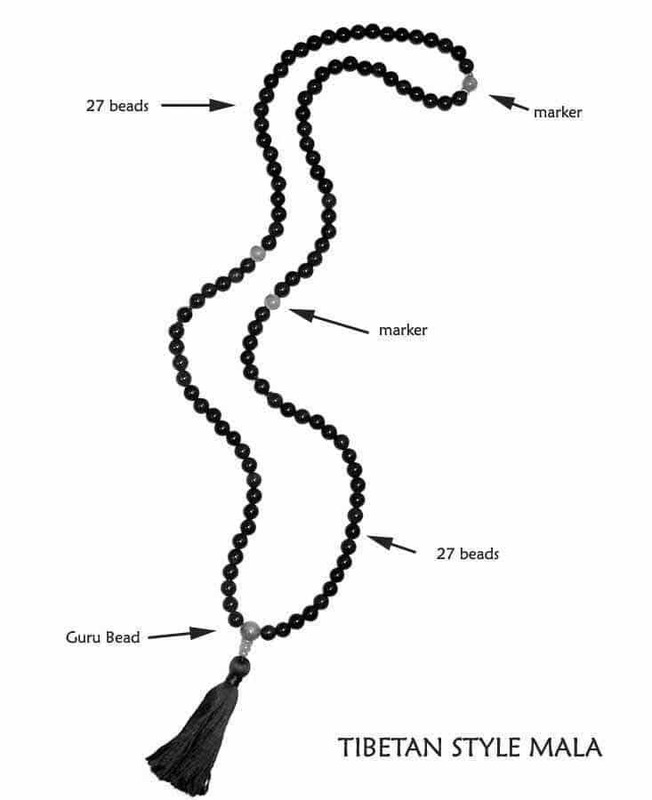 No Mala will last forever, but if your prayer beads, made by us, break within 30 days from order date, we will offer one complimentary re stringing with the original design. Any imported mala such as power beads or juzu are not covered under our manufacturers warranty. Imported malas strung on elastic, (stretch malas) can break after a very short time, so we recommend that you purchase a small spool of “Stretch Magic” from your local Michael’s Crafts to keep on-hand. Imported Bracelet Malas made with an adjustable slipknot can unravel easily, if that happens, you can take the frayed end and melt it with a lighter to prevent from further unraveling. We use natural gemstone beads, cut and untreated. Some gemstones have been color enhanced, irradiated, dyed and or waxed depending on supplier and batch. The colors should hold up well, do not wear for long periods of time around neck or wrist, expose your mala to excessive sweat, sunlight, acetone, or wear in the shower, pool or ocean. We do not accept used mala returns for gemstone color-fastness, but all will be well if you treat your mala with care! For malas made by us that break within the 30 day warranty period, please email us first and send your beads back to the address that we provide. Warranty covers all labor and materials but excludes return shipping charges. Warranty does not protect against customer damage or misuse, and excludes shipping damage. Redesigns are not covered by warranty, and restringing after the 30 day period, can be ordered online using this form. We have a “be always kind” policy. Harassment in any manner or form on the site or toward any person(s) at Sakura Designs, including via e-mail, IM, or by use of obscene, insulting, defamatory, threatening or abusive language, is strictly forbidden. Sakura Designs, LLC reserves the right to refuse or terminate service and /or all contact at any time, and we will do it if you behave this way. You agree to defend, indemnify and hold Sakura Designs, LLC/ BuddhistMala, our registered trademark, and all of it’s staff and affiliates, harmless from and against any and all claims, damages, costs and expenses, including attorney’s fees, arising from or related to your use of this site. All text, images, specific descriptive copy content, web domain name buddhistmala (registered with the USPTO), and any confusingly similar version thereof, and select designs, are the sole property of Sakura Designs, LLC. and may not be reproduced in any manner, and are protected under International Copyright Common Law by the WIPO, and the USPTO. Customer service hours, relating to your use of this site, even to defend us from policy infringements, as well as public defamatory or libelous harm, financial or otherwise, are billed at the rate of $100/ hour for staff time, and at the rate of $400/hour for use of our legal representation. Buddhist Mala Policies: Products subject to availability. Liability will be limited to the purchase price of any product, excluding all or any shipping costs involved. We are not liable for product or packaging material misuse, or any harm to any persons with the use of any product or packaging material. We cannot guarantee third party shipping companies such as The United States Post Office , but we can always provide your receipt for proof of delivery. All international orders, under $500.00 USD are shipped via US Priority Airmail or US Express Mail and is not traceable en-route via the USPS database, but proof of shipping with your customs number can be confirmed online. You will receive an auto-notification from The United States Postal Service on the day that your order ships. International shipping for all orders is at the customers entire risk, and we must waive all liability for all circumstances in other countries, including but not limited to: the shipment is refused by customs or the post, lost, rejected, confiscated, stolen, damaged, mis-delivered or delayed. Some countries will require a formal entry, and customer agrees to pay all possible brokerage fees/ duties involved. You are required to contact your post if need be to clear items from customs, and in the event of loss, delay or confiscation, you are required to fill out a loss report with your local post, using the Customs Number we provide. Please note that the postal database standardize international addresses to our system and will place the postal code after the county. For the State, please choose “None” from the drop down menu, and this will show up on your receipts. As acustomer who chooses to use this site, you have read, understood and agree to this as well as our before-mentioned posted policies and procedures above. We have a “open door policy,” so please contact our customer support team anytime, with questions concerns or feedback. Third parties that receive it: Active Campaign Mailing, Paypal, Google, Facebook Store Pixel, Askimet Spam Blocker, LiveChat, and our trusted internal developers and trusted plugin apis. Our 27/7 Secure, 128Bit encrypted entire page website, uses the standard WordPress platform with a powerful security shield, with constant security monitoring. The engineers of our template are working to ensure their GDPR compliance. Sakura Designs, LLC is not based in the EU, nor do we have a distribution location there. However, we do ship internationally, and we respect requested privacy and security changes to protect our customers. For our blog and blog comments, we use a spam blocker plugin and here is their privacy notice: https://automattic.com/privacy-notice/. We do encourage you to sign up for our newsletter and be entitled to web coupons, sales and notices, and your email address is again, 100% privacy protected. You can opt-in to our mailing list. Customers who place orders are automatically subscribed to our internal mailing list, to be notified of updates, sales and security notices, with the option to opt-out at anytime. Thank you for your interest and support, and we are positive that you will enjoy our fine collection of sacred beaded designs. 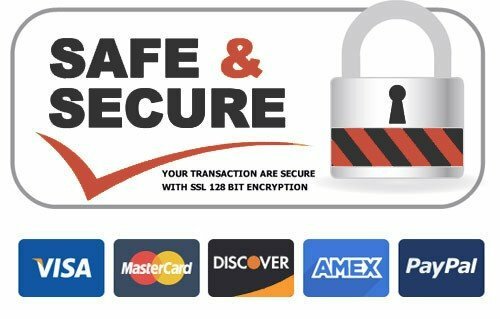 Shopping with us is safe and secure, warmest welcome!